For some reason I have always thought of frozen art as a winter thing. It wasn't until we did our Balloon Ice Sculptures this winter and another friend wrote that she had done them with her daughter in the summer that it even occurred to me how much fun ice play could be in the summer. The Bean did a project in her preschool class this winter where they painted with ice cubes, which seemed like so much fun I thought we would give it a try this summer. But instead of painting with ice cubes I thought it might be fun to try Popsicles. We have several Popsicle molds since we like to make so many Popsicles in the summer, I used an inexpensive one from Ikea and filled each cup half way with washable tempera paint. The washable turned out to be key since this project got messy! The Bee then helped me fill each mold the rest of the way with water and stir the paint with a chopstick to combine it. We then put the tops back on and stuck them in the freezer over night. The next day we took them out on the front porch and spread out a bunch of pieces of paper. The girls had a great time painting with the Popsicles. 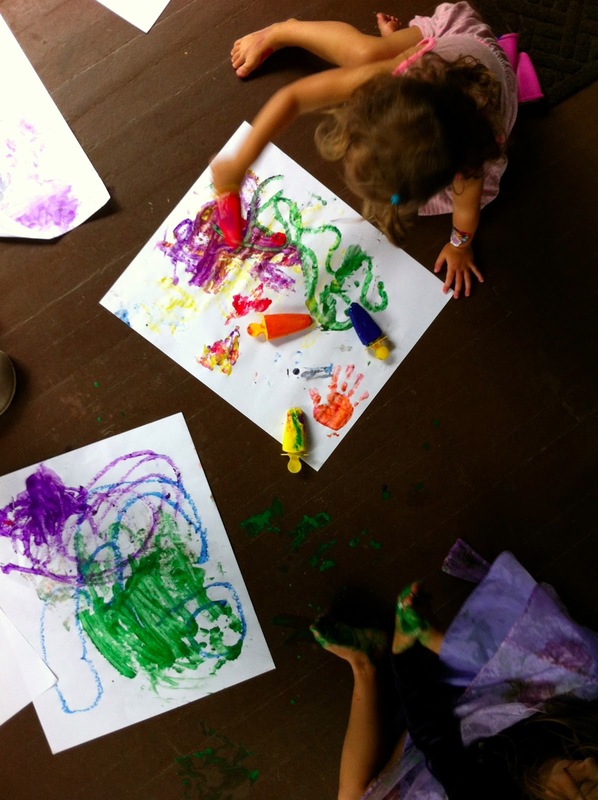 The Bee quickly discovered they were just the right size for painting her hands and feet and making prints. They loved that if you set them down they melted a little leaving a puddle of paint behind. They both painted for while only using about half the paint Popsicles. So when the were done I stuck them back into the molds and back into the freezer to be pulled out another day.